One of the minor triumphs of HLD-NAC is that can predict the shape and size of drops (oil in water or water in oil) around the HLD=0 point. 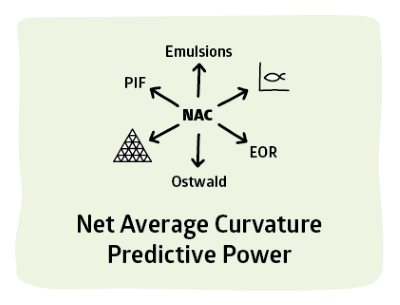 This is of specialist interest (nanotechnologists should appreciate it), but it makes the point that HLD-NAC is a powerful predictive tool still, astonishingly, under-appreciated. The prediction comes from the HLD then the surfactant's head, tail and MWt, plus its volume fraction φ. The NAC part of HLD-NAC makes it possible to estimate the shape and size of the microemulsion drops - and, therefore, the viscosity of the microemulsion. The key input, as so often, is the HLD. 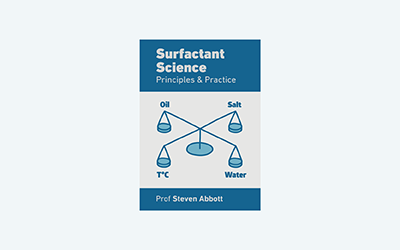 Then there is the vol fraction of surfactant, φ, its MWt (from which the number of surfactant molecules can be calculated), its tail length, L, and its head area, A. Far from HLD=0, and with inefficient surfactants (small A, small L) or with low amounts of surfactant, the drops are small and spherical. As you get closer to HLD=0 and/or the system is more efficient, the drop radius, rd increases till it reaches a limited curvature. At that point, the drop volume increases by elongation, with a length, l. When the drops are very long they start to produce a higher viscosity, µ. The drops are shown as orange (oil) in water (blue) or as blue (water) in oil (orange) according to whether HLD is negative or positive. When the drops are calculated as being too large the calculations no longer make sense and the system is shown as being Type III.